Forgetting or forgiving – are they mutually exclusive or necessary parts of the same coin for survivors of sexual violence? The politics of forgetting would suggest that they are the same, that forgetting requires some level of forgiveness. Otherwise the mental exercise is essentially moot and you, at the core, hold onto a hurt that might affect you far more than those who harmed you in the first place. As a survivor I’m not quite so sure. Should this be the goal? Is it necessary? Ideal? Possible? Are their long-term consequences for forgetting as quickly as possible? Do our bodies carry our pain long past the mind’s conscious connection to the traumas inflicted on them? Will it continue to echo long past the association is pushed to the back of our brains? Both forgetting and forgiving are incredibly difficult processes. They require one to compromise, which is a particularly difficult thing to ask of someone who did not request or deserve the pain that they suffered. It requires a process by which a survivor must have the mental and emotional space to let go of something that someone has done to them. This requires time. 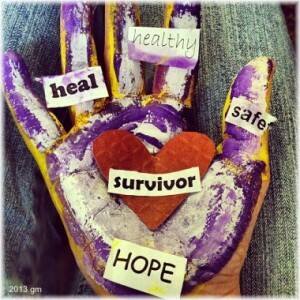 It requires healing, which may involve professional assistance, often far too expensive for many survivors. It might require a legal process or other form of justice. Recovering from sexual violence is an individualized experience, but it does require overt and specific actions, possibly even dependent on actions not fully in the control of the survivor. It requires patience and understanding. How many people are prepared for that long a haul? How many survivors have people in their lives with enough consciousness to allow the process to proceed at the pace necessary for healing to happen? Perhaps the answer is not the difference between forgetting and forgiving, but rather the definition of forgiving. Does forgiving have to mean that you absolve your perpetrator of guilt? Does it mean reducing their sentence, literal or figurative? Does it mean forgiving yourself? Does it require a level of personal kindness we’re not typically conditioned to allow ourselves? Is it all of the above? I don’t know the answer. I’m not even sure there is an answer. I know that, for me, forgetting was not an option. Putting it all from my mind would have pushed it from my sub-conscious, but the echoes would have remained. My body still aches when there are triggers I have not found my around or through. I don’t know how long that will last. Forgiving does not feel possible to me either, yet letting go of the pain so that I can move forward is necessary. This balances plays itself everyday in mind, as I find new ways to breathe, as I find a way to look ahead to a future that is so unsure.